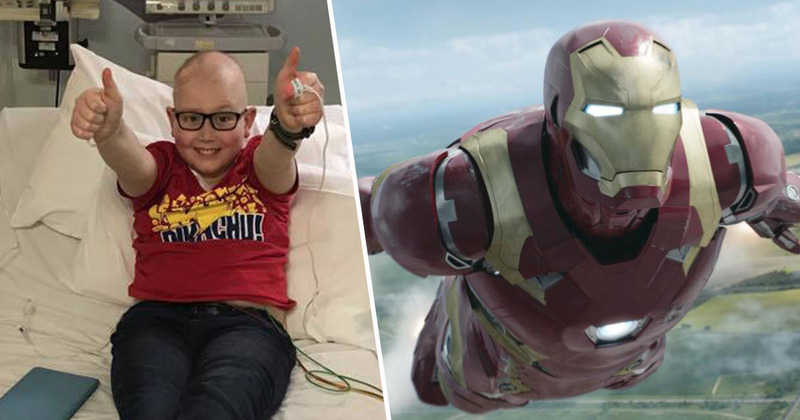 A young Marvel fan has been given permission by the studio to have his favourite superhero – Iron Man – on his gravestone. Ollie Gardiner, who sadly died from cancer aged just 13, was a huge film fan. He even got to have a private screening of Star Wars: The Force Awakens, while he was undergoing chemotherapy treatment, as he was so desperate to see it but couldn’t attend a regular screening due to risk of infection. Ollie’s family wanted to honour their son with a gravestone, which would have on it an etching of Iron Man, Ollie’s favourite superhero. Ollie’s parents, Pete and Jane Gardiner, posted about their son’s journey on Facebook, revealing that, once the church agreed on Ollie’s headstone, they would need permission from Marvel, too. Three years ago today, Odeon Aylesbury gave Ollie & I a free private screening of “The Force Awakens”. Children on Chemo aren’t allowed in crowds in case of infection and Ollie was desperate to see this film. It was so kind of such a huge company to help us. We have just been through the process of ordering Ollie’s headstone and after his hero “Ironman” had proved such an inspiration during Ollie’s treatment, we wanted him represented on the grave. After a little persuasion, the church said we could have him on a few conditions, one of which being that the Marvel Corporation gave their permission. I thought that would be impossible to obtain, but contacted them anyway. Ollie sadly died just over a year ago, but this touching gesture will make sure he’s remembered in the best way possible. Marvel’s kind offer of contacting the Church of England on behalf of the family also shows how much they care about their fans like Ollie. The young boy obviously knew a good hero when he saw one. Iron Man may not officially be ‘the first Avenger’, but he is the character with whom the movie studio launched the Marvel Cinematic Universe as we know it today. The first Iron Man film kick-started a franchise that now spans 19 films, with more on the horizon. Iron Man, aka Tony Stark, played by Robert Downey Jr, is a mainstay of the Marvel films. He has ties with almost every character in the MCU but, unlike some Avengers, he is just human (albeit incredibly intelligent and with the means to build and buy whatever he wants). Stark’s Iron Man suit, in fact, is the reason Nick Fury begins to recruit the Avengers. Three years ago today, Odeon Aylesbury gave Ollie & I a free private screening of “The Force Awakens”.